Book a hassle-free private transfer from Syracuse to Palermo, which includes a 2-hour sightseeing stopover at the Valley of the Temples. Travel in style with a private driver to chauffer you from the southeast to the northwest of the island. Admire the Mediterranean landscapes and break to visit the Valley of the Temples in the UNESCO-listed archaeological site of Agrigento. Enjoy personalized attention from your driver and a flexible itinerary that suits you. Meet your driver at your Syracuse hotel in the early morning and embark on a cross-country trip to Palermo. Your private vehicle will have air-conditioning and ample space, ensuring you enjoy a comfortable transfer. Drive north from Palermo and admire numerous picturesque vistas as you coast through the Sicilian countryside. 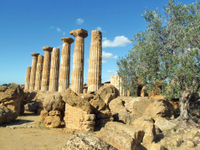 Listen as your driver reveals information about Sicily and its major landmarks. Pull over at the UNESCO-listed archaeological site of Agrigento to see the Valley of the Temples. Pay a fee to enter the site and witness the extraordinary legacy left by the ancient Greek people. Gain insight into ancient Greek architecture as you view the ruins from seven Doric temples, including the almost fully intact Temple of Concordia. Afterward, perhaps refuel with lunch (own expense); ask your driver for recommendations. Next, continue driving north toward Palermo, Sicily’s bustling capital. This eclectic city bears influences from its many former rulers — Greek, Roman, Arabic, Norman and Spanish — and offers a multitude of things to see and do. You’ll be dropped off at your accommodation in Palermo, where you can deposit your bags before setting out to explore the city on your own.